A fresh-ginger jolt, coupled with the bright lights of lemon, are one of the reasons you’ll find me lifting a pint of Rachel’s Ginger Beer where ever I can find one. And it’s also why that sparkling refresher takes a star-turn in lively libations at Lark, Licorous and La Bete, pouring it on at Barrio, 5 Corner Market Bar & Kitchen and How to Cook a Wolf. 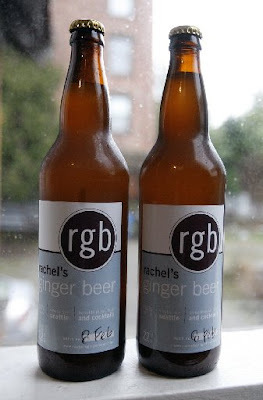 Rachel’s Ginger Beer: as the label says, its fresh ginger jolt “benefits mind, body and cocktails.” I’ll say! The latest to join Rachel’s fan club: F.X. McRory’s, where Marshall’s boyfriend and business partner Adam Peters pours drinks — when he isn’t busy helping brew beer in the borrowed kitchen at Licorous on Capitol Hill. 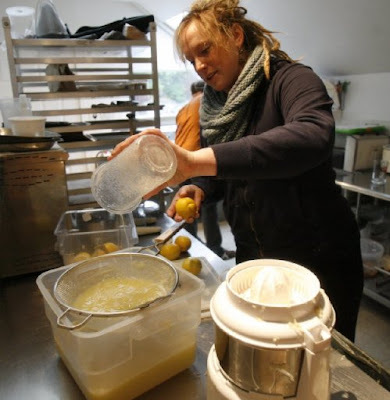 There the pair handcrafts 30 gallons of ginger beer weekly, an amount expected to double as they keep up with the demand for their recipe for success: a mix of gingerroot, lemon juice, purified water and sugar. Disappointed with the mass-produced ginger beer available in the U.S. after living and traveling abroad, Marshall researched recipes and began experimenting. Her early attempts were a bust. Turning to professionals for help, Marshall learned about forced carbonation — introducing her brew to CO2. “It took nine months to perfect the recipe,” she says. A recent morning found Marshall and Peters steps from the bar at Licorous, where you might order a “Joyful Ginger” composed of ginger beer, ginger vodka and limoncello. In that kitchen’s close quarters, over several hours, the couple processed 60 pounds of lemons and 30 pounds of ginger. “It gets easier with each pressing,” Peters insists while shredding the knobby root in an industrial-strength food processor. 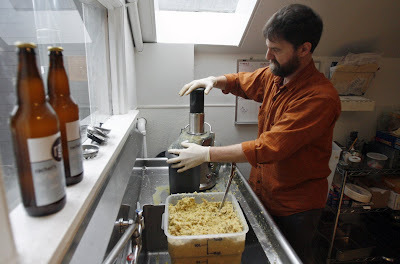 Making ginger beer is a two-day process, Marshall explains. On day one, they extract the ginger and lemon juice, make a simple syrup, marry those ingredients and refrigerate them overnight in stainless-steel kegs. On day two they carbonate the kegs, sanitize and fill 15-dozen bottles and send them out the door as fast as possible. Because it has no preservatives, Rachel’s Ginger Beer must be refrigerated. Because it’s an all-natural product, you’ll find sediment in those bottles. Marshall considers that a good thing. “Depending on what kind of crops are growing around the lemon trees, sometimes the lemons are more floral, sometimes more citrusy,” she says. For now, Rachel’s sparkling sensation is available only at select restaurants.